G. William “Billy” Beale, CEO of Richmond-based Union Bankshares Corp.
For more than six years, short-term interest rates have hovered near zero, but that could change soon. Federal Reserve Chair Janet Yellen reaffirmed in July the central bank’s plan to start raising interest rates before the end of the year. If and when that happens, G. William “Billy” Beale, CEO of Richmond-based Union Bankshares Corp., which operates Union Bank, will be thrilled. In anticipation of Fed action, Union has been restructuring its balance sheet to be more asset-sensitive. Its actions have included tying more loans to floating rates, shortening the average life of its investment portfolio and emphasizing lower-cost, less reactive deposit vehicles like negotiable orders of withdrawal (NOW) and money market accounts. Unless, of course, the economy isn’t strong enough to absorb the rate hike. For all the hopes the banking industry has been putting on rising interest rates, an actual Fed move “will bring a lot of anxiety, in addition to great optimism, for both community and national banks,” says George Morgan, SunTrust Professor of Finance at Virginia Tech’s Pamplin College of Business. The big fear, of course, is that rising interest rates will cause the economy to weaken or even slide into recession resulting in a new round of loan defaults. Another possibility? The Federal Reserve could raise rates too quickly, effectively flattening the yield curve between short- and long-term rates and minimizing profitability for banks. The Fed also could raise rates temporarily and then drop them again, effectively hurting the same banks that the interest rate increase initially helped. And any change could create market volatility. The last scenario, says Morgan, would play in favor of national banks that offer trading operations, M&A advisory services and other fee-based services. “Increased volatility creates more volume for those kinds of transactions, and so I think they’ll do very well in that environment,” he says. Fortunately for smaller community banks, the Federal Reserve appears to be fully aware of the danger of moving too quickly, says Chadwick Curtis, assistant professor of economics at the University of Richmond’s Robins School of Business. In a March speech, he notes, Yellen used the term “gradual” 13 times in describing her expected monetary policy. Most community banks have spent the last several years preparing for the possibility of both interest rate hikes and the ongoing uncertainty. Morgan notes that banks with a strategic portfolio of floating rates loans, which will reset quickly in a rate increase, and retail deposits, with rates that will rise more slowly, are sure to fare well when the Federal Reserve initially raises rates. Reston’s John Marshall Bank is one of those banks. Its asset and liability committee intensively analyzes the interest rate gap and the potential impact interest rate changes will have on various bank operations and metrics. The committee will continue its work in earnest when the Federal Reserve finally acts. Over the duration of the low-rate era, John Marshall Bank has controlled its expenses, managed its overhead and maintained one of the highest efficiency ratios in the industry. “As long as you understand where your portfolio is, and you manage that interest rate risk, then an interest rate hike done in a controlled fashion will likely be very positive for banks, as long you watch what you’re doing and don’t get too far out with fixed interest rates on loans,” says Ridenour. Michael Joyce, president and CEO of JoycePayne Partners, a financial management firm in Richmond, says that many banks have used the low-rate era to hedge their bets against future interest rate volatility by adding new sources of non-interest-rate-reliant revenue. “They’ve done a good job of diversifying, which has stabilized their revenue streams and also allowed them to more easily comply with capital requirements,” he says. Many smaller banks, for example, have joined national banks in putting an emphasis on fee-based wealth management services. According to data from Fiserv Intelligence Solutions published in American Banker magazine, trust income grew by 21 percent for the banking industry from 2012 to 2014 and accounted for 70 percent of wealth management income in 2014. Leading the pack was Union Bank, which effectively doubled its trust revenue through its acquisition of Charlottesville-based Stellar One in January 2014. 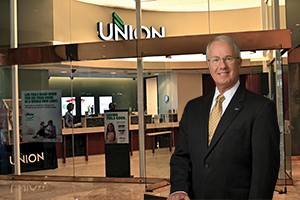 Beale notes that trust income, along with other fee-generated income, such as mortgage underwriting and service charges, currently accounts for 21 percent of Union Bank’s total revenue. American National also has added variety to its income stream. The bank has had a Trust Investment Services Department in place since 1927. After the Great Recession, Haley says, the bank took steps to bolster that service, increasing assets from $531 million in 2011 to $750 million today, a 41 percent jump. The bank also has provided merchant services and bankers insurance, emphasized debit card and debit interchange income, and eliminated fee waivers on commercial analysis and other fee-based services. Officials also have worked to cut expenses, most significantly by encouraging customers to switch from paper to electronic statements. “We’ve dug way down and made all these little things a major strategic priority, which have all added up to a big number,” Haley says.